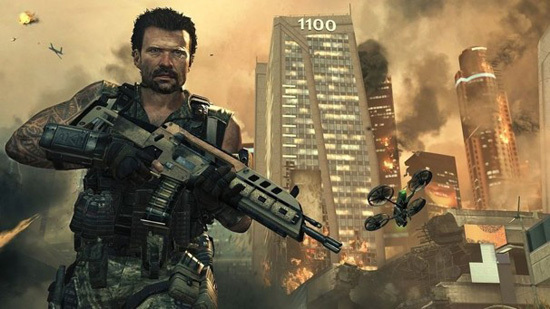 GAME NEWS: The First Trailer for Activision's 'CALL OF DUTY: BLACK OPS 2' Takes Us To 2025! Activision has revealed the next chapter in their cult-like Call of Duty franchise with a brand new trailer for Call of Duty: Black Ops II. Treyarch return to the forefront as the current game developer & Black Ops II is their follow up to their very playable but horrendously unfinished/ glitchy 2010 effort Call of Duty: Black Ops. The new game hits shelves this November 13th & is officially described as follows: Pushing the boundaries of what fans have come to expect from the record-setting entertainment franchise, "Call of Duty: Black Ops 2" propels players into a near future, 21st Century Cold War, where technology & weapons have converged to create a new generation of warfare. The game is set in 2025 and revolves around a cold war between the United States & China over rare earth elements. The unmanned drones that the U.S. military built for protection become the enemy when a terrorist named Raul Menendez takes control of the machines. Hit the jump for the details, let hope Treyarch have learnt from their previous venture & finally deliver. I'm reading: GAME NEWS: The First Trailer for Activision's 'CALL OF DUTY: BLACK OPS 2' Takes Us To 2025!Tweet this!